Scottish Dream trilogy captures the lives and loves of three brothers and the secret they each hold. 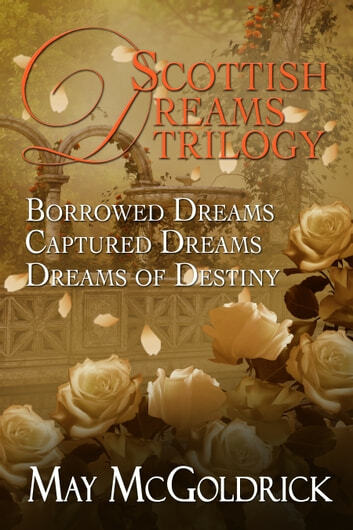 This collection includes the complete novels of Borrowed Dreams, Captured Dreams, and Dreams of Destiny. Driven to undo the evil wrought by her dead husband, Millicent Wentworth must find a way to save her estate and free the innocent people her husband enslaved. Her only hope is a marriage of convenience with the notorious widower, Lyon Pennington, fourth Earl of Aytoun, who just may be the most handsome-and caring-man she's ever encountered. I enjoyed reading the whole trilogy, the flow is fantastic between books, the romance between couples is well written, at times very sweet, but very possible. I love the mix of people, the good and the bad. Gives us hope and a good escape, yet not to far from reality. Gwyneth, a secret writer, is kidnapped while heading to wed at Gretna Green. She does not appreciate being kidnapped and thus goes the tale that also is a mystery of a Pennington bride’s murder. It was hard to put down. WOW What a wonderful series I had trouble putting my eReader down I needed to keep reading to see how the plots worked out. Thank you for a wonderful read I have now finished 3 of your series. I’ve more than loved reading this trilogy. Got you enthralled from the beginning till the end. Can’t wait to read other books from these authors. Highly recommend you all to read this trilogy. Wow! What a trilogy... it was amazing I could hardly put it down. The twists and turns of the stories of each brother were stunning. It was so exciting to follow the intricacies of the characters and the history that was covered...i.e. The results of slavery, spousal abuse and the social norms that trapped women in loveless marriages. The fact that women could not write under their own name brought to mind the Bronte sisters. The reveal at the end of the third story was an amazing finale. A really good read!